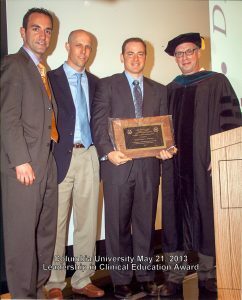 On May 21st, SPEAR received the Columbia Award for Leadership in Clinical Education, during the commencement ceremony of the 2013 class of Columbia University School of Medicine’s Program in Physical Therapy. SPEAR is one of only two private clinics to have ever received the award, which acknowledges a clinic or institution for its contribution to the education of future therapists. On hand to accept the award were President Dan Rootenberg, Co-founder Dave Endres, and Director of Operations Ryan Kitzen. Also in attendance were Chelsea Director Laura Muzzatti, 56th street therapists Kasey Johnson and Sarah Tabia, and 44th street therapist Cathy Campbell. Kasey Johnson, therapist and Center Coordinator for Clinical Education, created a curriculum that aims to “produce colleagues and the kind of people you want to work with.” Each student is partnered with a seasoned SPEAR therapist, and thus receives not only hands on clinical training with an expert, but also training in the specialized customer service that has become the benchmark of SPEAR’s patient care. Clockwise from the right: Dan Rootenberg, Dave Endres, Ryan Kitzen, Sarah Tabia, Kasey Johnson, Cathy Campbell, Laura Muzzatti, and Meg Tanglao. 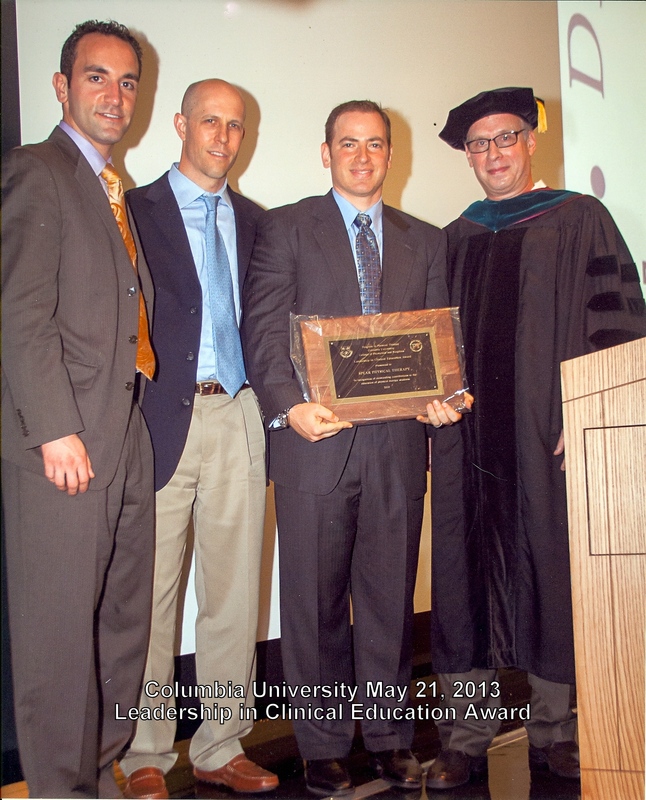 I want to thank Randy Kolodny and everyone at Columbia University for the award for Leadership in Clinical Education. It is an honor to be up here accepting this award on behalf of SPEAR Physical Therapy. We are humbled and appreciative of being recognized by such a respected and world renowned institution. I also want to thank the incredible team we have at SPEAR, eight of whom are here today. My late father was a professor of electrical engineering at Columbia for 7 years, so it is also personally a meaningful connection for me to be standing here. 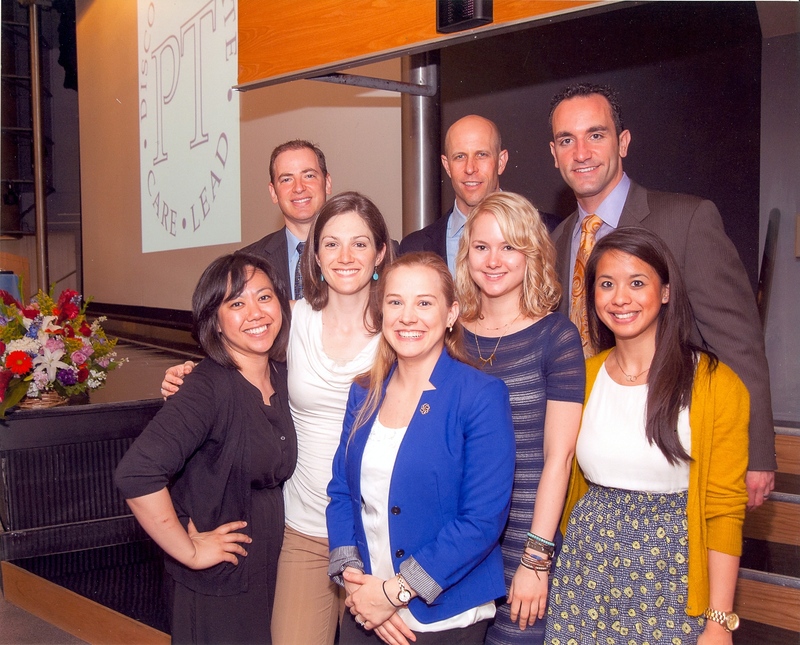 Graduates, as you sit here on the precipice of starting your careers in PT. I want to offer you the formula for success…both professionally and personally. My advice is to never settle and don’t seek merely to be comfortable. Deliberately stretch yourselves and continually challenge yourself. That means putting yourself in uncomfortable situations. Do something every day that scares you and before you know it you will have stretched and grown and it will no longer be that challenge it once was. It is good to seek contentment in life, but never be satisfied, or rest on your laurels. Thrive for personal development and continued self-improvement. Columbia University produces excellent graduates who have made a tremendous impact on our practice. Sarah Tabia is a new leader at our 56th St Location will be a clinical instructor later this year. Kasey Johnson, our clinical coordinator, has been fundamental in continuously improving and standardizing our student clinical experience. At SPEAR we believe in devoting time, resources and energy towards the development of the next generation of therapists. We pair students with instructors in an open source learning environment, providing milestones and standards based on a learning and clinical progression. Laura Muzzatti is the clinical director of our new Chelsea office and in the two months that Chelsea has been opened, Laura and her team have already impacted over 202 lives. These three recent graduates are great examples of how to keep striving for more and stretching yourself beyond what you thought you were capable of. The story of how we were notified that we were receiving this award exemplifies the theme I am trying to convey today. In April, our Executive Leadership Group, comprised of our directors, met for our monthly meeting to discuss current challenges, evelopments and innovations. On our agenda were ways we could improve our clinical program. We had decided to formally announce Kasey as the new clinical coordinator, create a student feedback form and enhance the curriculum, all designed to improve the clinical experience. The next day I got a call from Randy telling us we were given the award for clinical excellence. To me, the irony of working to improve something, and then the next day receiving an award for the very thing we were trying to improve, illustrates the message of the moment: Never be satisfied! Again, thank you for this award and best of luck to all the graduates!